Keisha Smith-Jeremie was far from home, missing the warmth of sunlit days and tropical breezes in the Bahamas. She longed for the halcyon days of childhood spent climbing trees and indulging in the sweet and tangy fruit there for the taking. It all seemed impossibly far away on wintry days at the University of Virginia. Until Keisha found the Granny Smith apples that are native to the Shenandoah Valley. She had always loved applesauce, and she would bring back a piece of her childhood by making her own. By a happy happenstance, she didn’t know that she was supposed to remove the apple skins. 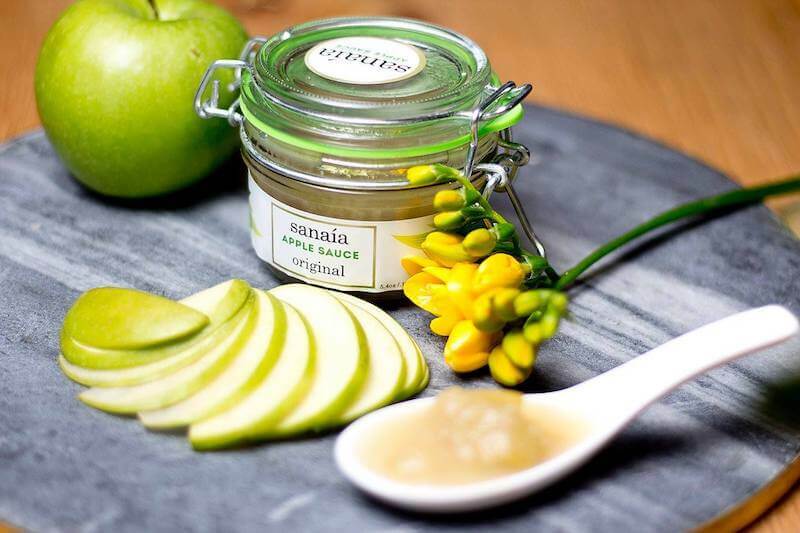 The result: Sanaia Applesauce with its signature tart taste and full-bodied texture. Later, Keisha expanded on the original recipe with flavors that she encountered while traveling around the world, blending the homespun taste of chunks of apples with tantalizingly exotic notes of tropical fruits, spices and botanicals. The gourmet applesauce currently offers, in addition to the original recipe, guava, tamarind, hibiscus, lychee, pear, sour cherry, elderflower, lavender and ginger. Keisha is, at first glance, an unlikely purveyor of applesauce, no matter how exquisitely made. Her “day job” is Chief Human Resources Officer for News Corp with responsibility for Corporate Security, Philanthropy and the Global Environmental Initiative. In 2017, she added to her CV “CEO and Founder of Sanaia Applesauce” and launched the world’s first “grown-up” applesauce that fits right in with our increased awareness of the importance of eating healthfully. Sanaia is all natural and contains no dairy products, fat, cholesterol or sodium. It’s a “no-guilt” yet delectable snack, elegantly presented and environmentally friendly. From beginning to end, from the raw ingredients to the finished product in a pretty glass single-serve jar, Keisha insists that the process and the packaging contribute to the conservation of our natural resources. There are endless ways to serve and enjoy Sanaia Applesauce. Right out of the jar, of course. Served as a side dish with dinner. Topped with fruits, granola or muesli. Warmed up and used as a topping for oatmeal, ice cream or pie. Used as a glaze for pork chops. Mixed in with mac and cheese. And my personal favorite: Put some jars in the freezer while you prepare dinner, and you’ll have a sensational dessert.